I’ve always been one of those people who have all good intentions of trying something new, but actually never seem to find the time to get round to it. Sound familiar? I’d been like this for years with Yoga, I couldn’t seem to read a newspaper or social media post without someone waxing lyrical about the ‘mind and body’ benefits that this ancient exercise promotes. So when I discovered I was expecting a baby, I immediately began to think about how I was going to keep fit and healthy for the next 9 months. A fan of pounding the treadmill and leaping around in a Body Combat class wasn’t really going to be feasible for much of my pregnancy, not least due to the physical impact carrying a baby had on my small frame, so I had to have a rethink, and that is when I discovered Pregnancy Yoga. The perfectly named The Secret Space in my hometown of Hertford, Herts, proved to be my perfect pregnancy yoga sanctuary. Offering classes to ladies from 16 weeks onwards, I decided it was time to give this class a whirl. Already suffering with a growing bout of anxiety too, I also needed some help and support in learning how to keep calm and embrace my changing body – something I found rather hard to grasp I’ll admit – so yoga and all the benefits it offered seemed too good to be true. I’m pleased to say it wasn’t. The moment I hit the 16 week pregnant mark, on a sunny Sunday morning, I waddled along (I got big quickly!) to my first class, slightly nervous at what to expect. Yoga can have an air of mystery and superiority about it, and I was expecting to see all these Madonna and Gwyneth Paltrow-esq yogis contorting themselves into all sorts of weird and wonderful shapes, while I struggled on barely mastering a ‘downward dog’ pose. I (thankfully) couldn’t have been more wrong. There were about a dozen other women at varying stages of pregnancy dotted around the room, and as Angela the instructor welcomed me, she instantly made me feel at ease as she loaded me up with mats, bolsters and blocks….all of which I had not a clue what to do with! Pregnancy yoga is a LOT about breathing, it’s an invaluable skill to learn and practice anyway, but particularly when you’ve got a baby to ‘breathe’ out on the horizon, this is a key element, and one drummed into us with every exercise we tried. Angela explained that she followed and practiced a combination of yogas, but we would be doing mainly ‘hatha’ yoga. The class started with the first of many gentle breathing exercises (my favourite was the ‘dandelion breath’), allowing our busy minds and lives to just ebb away into insignificance as we gave ourselves ‘permission’ to ‘just be’ for the hour ahead. Letting go of all of my pent up stress and anxiety was euphoric! Finding the right comfortable pose for each of us in the class was really important (I loved the comfort that ‘pigeon pose’ gave me), and finding ways to support our growing bumps was phenomenally useful…and relaxing. As the class progressed we were guided into a range of easy to follow poses, lots of stretching and strengthening, which we could adapt according to our ability and size. Some were tough I’m not going to lie…balancing my burgeoning bump in ‘warrior pose’ took some ‘correcting’ at times, and the pelvic floor ‘squeezes’ never came easy to me – before or after birth! But by far the best bit of the class was the guided meditation at the end. After 45 minutes of stretching, sweating and breathing, we’d all be invited to lie down comfortably on a mat with bolsters, pillows and blocks wedging our heads, bumps and knees to provide maximum comfort – not an easy feat I can tell you when you have a weighty baby squirming around inside – and with soothing music and the instructors voice guiding us all into a relaxed tranquil ‘sleep’ it was hard to peel oneself up off the floor when it ended. I found the space, quiet and ‘me’ time that yoga offers hugely cathartic, it really helped me connect with my baby in my tummy as focus was put on both of us being as one and ‘working as a team in birth’, and the added bonus of learning stretches and moves which helped my physical health and strength really helped during the final few months leading up to labour. It became my favourite thing to do each week, I’d live for Sunday morning yoga, and I can honestly say it was one of the best experiences of my pregnancy, and something I recommend to every new mamma-to-be. 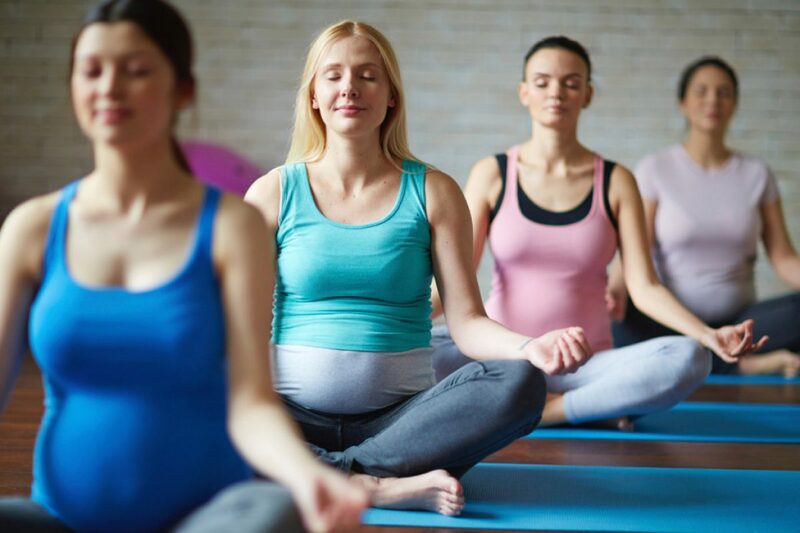 …..I’d never tried yoga before I got pregnant and being an anxious person I decided to sign up to it as I missed being able to exercise properly, and also needed to calm down (I like to work out several times a week)..